INT. PORTLAND COFFEE SHOP. DAY. A girl walks through the door, holding a book—Great Expectations. The coffee shop is full, and every person in it is wired to a machine: earbuds plugged into iPhones, faces lit by computer screens. Our Heroine sits down at a table, across from a girl her own age who's typing on a laptop. The laptop has a sticker on it, for a band called the Florals—a band Our Heroine happens to love. But Laptop Girl is too immersed in digital realms to realize that her soulmate has just taken a seat at her table. She clacks away at her keyboard. Our Heroine glumly turns her attention to Pip and Miss Havisham—the only friends she has. And then—quelle horreur—the café's wifi goes out! Laptop girl shuts her computer—and notices Our Heroine sitting right across from her. Free from digital distractions, a friendship blooms. Sound like a boomer PSA about how millennials are a generation of entitled cyborgs who can't make eye contact and never write thank-you notes? Kind of, but no: Great Expectations is a three-minute film produced by a group of seven girls, ranging in age from 15 to 18, as part of POWGirls, a new filmmaking camp targeted toward young women. The seven girls conceived, storyboarded, wrote, directed, and shot it. They did the editing. They made the opening and closing credits; they recruited strangers to act as extras; they got those strangers to sign media releases authorizing their appearance. They did, in other words, all the work that goes into making a short film—and they did it themselves. The Portland Oregon Women's Film Fest—POWFest—was established in 2008 to promote and support women in film. The festival, which is held annually at the Hollywood Theatre, showcases narrative, documentary, and short films; guests have included directors Kathryn Bigelow (The Hurt Locker, Zero Dark Thirty) and Amy Heckerling (Clueless, Fast Times at Ridgemont High). The development of an educational program is a natural outgrowth of POW's mission. POWGirls debuted in 2014, with a beta version of the program that saw six girls making a short film together over the course of the three-day POWFest. This year's POWGirls was a fleshed-out version that spanned five days, most of them at MetroEast Community Media in Gresham. The final production day was February 1, Super Bowl Sunday; only one girl wore a Seahawks jersey. "We're giving them high-tech gear, state-of-the art production," says Barb Myers, POWFest's education director. "They're gonna learn what aperture is, what ISO is, how to set their camera on manual. How to look behind the camera and use cinematography to tell their story. We really want to empower them to tell the stories that they want to tell." POWFest Executive Director Tara Johnson-Medinger compares POWGirls to the Rock 'n' Roll Camp for Girls, which her own daughter attended. "I saw the effect on my daughter when you take gender out of the equation," she says. "It's a tremendous power. I wanted to do that in terms of POWFest and growing the next generation of filmmakers. It completes the circle of POWFest, where we feature the work of women working today, bring in a successful director to impart her experience, and then bring the youth into the equation." ON THE FINAL DAY of POWGirls' 2015 session, the students gathered with their instructors to watch rough cuts of the two short films they'd made, working in two groups. The 14 girls had come from Beaverton and Silverton, St. Mary's and Lincoln High. Some of them paid $200 to be there (or their parents did); two received partial scholarships; four came for free. In the screening room, after they watched both films, the girls offered feedback that was good-humored and constructive. Someone pointed out the reflection of a cameraperson in a glass door. Someone else suggested that a particular slow zoom might be too slow. One girl pointed out that an elderly woman in the coffee shop scene was holding her phone upside-down. For the past 16 years, the Celluloid Ceiling—a comprehensive study "of women's behind-the-scenes employment in film," sponsored by San Diego State University's Center for the Study of Women in Television and Film—has broken down how women are faring in the film industry. The Celluloid Ceiling's most recent report was typically dire: Last year, women only directed seven percent of the 250 top-grossing films in the US. We represented only 18 percent of editors, only five percent of cinematographers, only 19 percent of executive producers, and only five percent of sound designers. In this room in Gresham on Super Bowl Sunday, though? It's 100 percent. RIDE THE RED MAX east to the very end of the line, walk about two blocks, and you'll find yourself at MetroEast, a nonprofit community media center that served as home base for the 2015 POWGirls camp. Access to resources—cameras, editing suites, studio space, and the human resources of mentors and teachers—is crucial for developing filmmakers, making MetroEast a natural fit to host POWGirls. The center, which broadcasts on several public access channels, offers anyone in the Portland area the opportunity to take affordable classes and use the station's equipment. "POW is an important partner for us," says Jen Dynes, MetroEast's education coordinator. "We want to serve underserved populations with media education and tools. Clearly there's a need for girls' media education. The class filled up almost right away." Dynes hopes that the upcoming POWFest will serve as a bridge for Portland's independent filmmakers, who could benefit, she says, from access to MetroEast's facilities. "We want to reach all members of the community and help them tell their stories," she says. ANOTHER KEY SOURCE of support for POWGirls comes from the Faerie Godmother Fund of the Oregon Community Foundation, established in 2006 by Portlander Vikki Mee in order to "specifically address the lack of females in key positions behind the camera, key decision-making positions in media leadership, and the resultant misrepresentation of women in front of the camera." Since then, the fund has supported young women through scholarships, production grants, and school programs. "When I asked the question, 'What can I do about this situation with the lack of women in decision-making in media?' the answer was to teach women about media, and to teach them how to tell a visual story," says Mee. "The more girls we teach, the more girls become interested in this field—that creates a little bit of critical mass." Many of the girls in the POW program are interested in careers in film, and see POWGirls as a way to gain valuable experience. "I decided to sign up because I'm really interested in going to film school and working in the industry," says Charlotte, age 18, whose favorite movies include Mean Girls and The Shining. "I imagine myself as a director because I often find myself taking on leadership roles," Charlotte says. Ann, 15, who loves The Sixth Sense, thinks she'd enjoy "screenwriting, directing, or maybe even storyboarding." Early film education can certainly lay groundwork for careers—but even when it doesn't, it can have a lasting influence on how media is consumed. "This experience definitely changed me as a movie watcher in both good and bad ways," says Charlotte. "I'll now be able to name the angles that I see in films and be able to see 'the rule of thirds' and things like that, which is awesome! However, I'll miss being able to just watch a movie, completely unaware of all the thought and work that goes into it." "The important thing is that they become literate, and they know that what's in front of their eyes has been crafted," says Mee. "It's somebody else's bias." LIKE MEE, many of the adults involved in POWGirls have strong feelings about the representation of women in film, the importance of promoting women's voices in pop culture, and the value of creating a supportive environment for girls to develop their skills. As MetroEast's Dynes wryly noted when I asked her why she thinks programming for girls is important, "There are the oft-quoted benefits of not being shouted down in a room...."
A few of the POWGirls I spoke with did identify the all-girl nature of the camp as an important factor in why they decided to attend. "I just think when it comes to movies, and media in general, you don't hear women's voices represented as often," said Kaitlynn (18, Die Hard, The Breakfast Club, The Runaways, Blue Is the Warmest Color, Inception, American Psycho... etc.). "The fact that it was an all-girls camp was one of the reasons I was interested. I think it's important for women's voices to be heard more, and especially important for young girls to find their creative voice. I don't think women are as represented in film as men are." Ellie, 17, told me that she "thought it was really cool that it was encouraging girls to get into film because it is really hard." Many of the girls, though, simply wanted to learn more about making movies. As Violet (15, Scott Pilgrim vs. the World) put it, "I thought it was interesting, but I wouldn't have not done it if it hadn't been [all girls]." Isabella (15, Pulp Fiction, Kill Bill, The Craft, and Heathers) said that she thought if the camp hadn't been girls only, her experience would be "fundamentally the same, it would have been probably a little more interesting, but I'm not sure we would have all warmed up to each other as quickly." I got similarly ambivalent responses when I asked POWGirls campers if they'd be more likely to hire women if they were in charge of a film. "I don't think that I would go out of my way to hire all women," said Lucy (15, The Lord of the Rings and The Hobbit). "If there are more women than men that are capable for the job, then right on! I think that if you were qualified I would want you on my team. That's all that really matters to me at this point because I'm just trying to make a good movie." Jessica (15, The Little Mermaid and The Hunger Games) agreed: "If I was a movie director, I wouldn't be biased about hiring men or women, but I would be a little bit easier on the women because working in the film industry is already hard and then being a women makes it even harder to get the job you truly want." As an aging feminist (hi!) who applies the Bechdel test to everything, it was fascinating to hear how the girls at POW think about their gender, and its limitations—or lack thereof. These girls don't need empowerment. They need tools. And that bodes better for the future of film than anything else. The films made at POWGirls can be seen on the big screen at this year's POWFest, which will run from March 12-15 at the Hollywood Theatre. 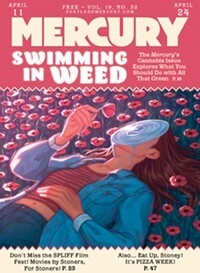 Watch for more Mercury coverage of POWFest as the festival approaches.